In June, 14 Queen’s Counsel were appointed across locations including Auckland, Wellington, Christchurch and Dunedin. Now the newly appointed silks are being called to the inner bar to take part in ceremonies described as some of the “profession’s most precious occasions”. The first ceremony was held a week ago in Wellington at the Old Number 1 High Court in Stout Street, and the Chief Justice presided. 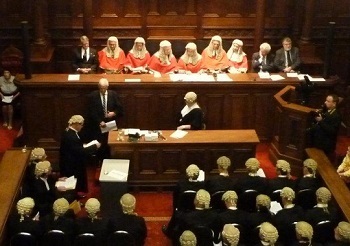 Judges from the High Court, Court of Appeal and Supreme Court sat on the bench in full ceremonial dress, or “reds”, to welcome the new silks. Geoff Sharp, a commercial mediator at Clifton Chambers, was present at the ceremony in support of fellow Clifton Chambers barrister Paul Radich QC, who was being called to the inner bar. Alongside Radich, the other Wellington applicants, Matthew Palmer QC, Matthew McClelland QC and David Laurenson QC, sat at the outer bar, robed in their new silk gowns. The ceremony was open to the profession and the public and there was a full court room, Sharp told NZ Lawyer. Barristers were also encouraged to robe, and many did, wearing gowns, wigs and bibs. After the traditional ceremonial process, the Chief Justice addressed the new silks in a manner that Sharp describes as informative and lively, and often with humour. Russell Bartlett QC, Stephen Bonnar QC, Paul David QC, Marie Dyhrberg QC, Antonia Fisher QC, Paul Rishworth QC, Paul Wicks QC. Prudence Steven QC, Peter Whiteside QC.